Originally published in 1914, Burroughs’s Tarzan, the ideal image of pure animalistic power at odds with the civilized world, appealed to readers from his very inception and become one of the most enduring icons of popular culture. In this classic tale, the struggle between the wild and the civilized is played out deep in the savage African jungle. The infant Tarzan is raised by apes and grows into manhood, learning to survive as the animals survive. When an expedition of white men brings the beautiful and cultured Jane Porter to the jungle, Tarzan enters civilization to win her love. 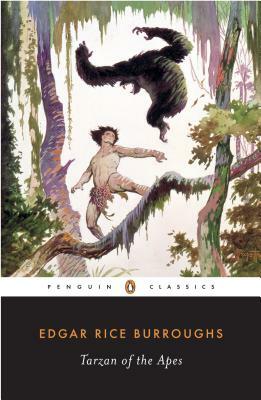 Edgar Rice Burroughs was born in Chicago, Illinois in 1875. After serving a short time in the 7th U.S. Cavalry, Burroughs was a shopkeeper, gold miner, cowboy, and policeman before becoming a full-time writer. His first novel, Tarzan of the Apes, was published in 1914, and along with its 22 sequels has sold over 30 million copies in 58 languages. Author of numerous other jungle and science fiction novels and novellas, including The Land That Time Forgot, Burroughs had a writing career that spanned almost 30 years, with his last novel, The Land of Terror, being published in 1941. He died in 1950 at his ranch near Tarzana, the California town named for his legendary hero. John Seelye is a graduate research professor of American literature at the University of Florida. He is the author of The True Adventures of Huckleberry Finn, Mark Twain at the Movies, Prophetic Waters: The River in Early American Literature, Beautiful Machine: Rivers and the Early Republic, Memory's Nation: The Place of Plymouth Rock, and War Games: Richard Harding Davis and the New Imperialism. He is also the consulting editor for Penguin Classics in American literature.